Age-old stone houses with porches overlooking cobblestone yards that have witnessed hundreds of years of history. 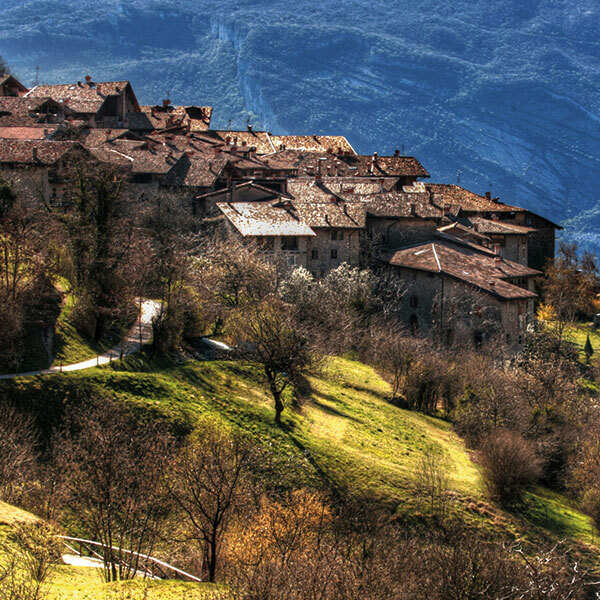 It is the best known of the villages that surrounds the municipality of Tenno and is one of the most interesting and best preserved sites in Trentino. An open air museum, poised between the Mediterranean feel of the north shore of Lake Garda and the typical Alpine landscape dominated by the Dolomites. Its unique position has earned it numerous awards; together with the Giudicarie and the Ledro Valley, it has been included in the UNESCO Biosphere (MaB) from the Dolomites to Lake Garda, as well as in the Italian Touring Club "Bandiera Arancione" (Orange flag). With Calvola, Pastoedo and Sant'Antonio, Canale is part of the ancient Vicinia delle Ville del Monte, an ancient form of administration where free men ran the territory: a life-sized bronze monument depicting men discussing the future of their small community commemorates them. In the village traditional festivals are held, with local craft markets at Christmas and in August the "Rustico Medioevo" (an event evoking the Medieval period) being the most famous. There are craft shops and cafés, a museum of ancient farming tools as well as a centre documenting the area's traditions, which is dedicated to the memory of the Trentino geographer and ethnographer, Aldo Gorfer.